Axis Of Awesome are one of a new breed of artists who, rather than complain about the Internet ruining their business, embraced it to achieve extraordinary success via their YouTube channel. And more specifically, with a magnificent rehash of 36 well-known songs in their now famous #4 Chord Song (21.5million views and counting). Great singers, and oozing bucket loads of musical, comic, and dramatic talent, they unleashed their high energy brand of madcap musical humour in a fun filled hour on a hot night in a sold-out Spiegeltent. Jordan Raskopoulos, Lee Naimo, and Benny David (The Human Jukebox) are great entertainers. Front man Jordan has a great stage presence and does a mean Elvis impersonation. Benny unfairly gets the role of the group’s fall guy, but he needn’t worry. Without him they’d be musically nowhere. Lee is their stand-in Johnny Cash, as well as having a tendency to be a little crass. There’s a line between dancing and wanking that shouldn’t be crossed! Together they are a great man band, and perhaps an even better boy band. Their send up of every boy band that’s ever lived was hilarious. Masters of the remix with a fine sense of comedy, but no original hits of their own in the traditional mainstream of showbiz, they are a remarkable success story, and testament to the fact that there are new ways of earning a following these internet days. Great energy, great music built around three great singing voices, and plenty of laughs. It’s a winning combination. Axis Of Awesome performs Viva La Vida Loca Las Vegas at The Garden Of Unearthly Delights’ Aurora Spiegeltent until Sun Feb 22. 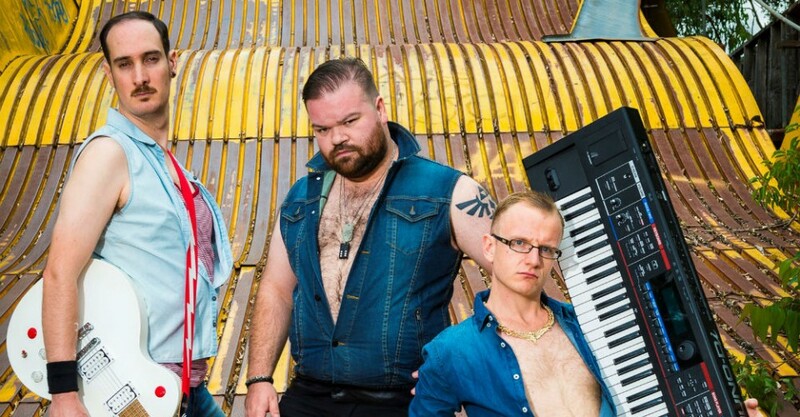 The Garden Of Unearthly Delights’ Aurora Spiegeltent, Sat Feb 21 Axis Of Awesome are one of a new breed of artists who, rather than complain about the Internet ruining their business, embraced it to achieve extraordinary success via their YouTube channel. And more specifically, with a magnificent rehash of 36 well-known songs in their now famous #4 Chord Song (21.5million views and counting). Great singers, and oozing bucket loads of musical, comic, and dramatic talent, they unleashed their high energy brand of madcap musical humour in a fun filled hour on a hot night in a sold-out Spiegeltent. Jordan Raskopoulos, Lee Naimo, and Benny David (The Human Jukebox) are great entertainers. Front man Jordan has a great stage presence and does a mean Elvis impersonation. Benny unfairly gets the role of the group’s fall guy, but he needn’t worry. Without him they’d be musically nowhere. Lee is their stand-in Johnny Cash, as well as having a tendency to be a little crass. There’s a line between dancing and wanking that shouldn’t be crossed! Together they are a great man band, and perhaps an even better boy band. Their send up of every boy band that’s ever lived was hilarious. Masters of the remix with a fine sense of comedy, but no original hits of their own in the traditional mainstream of showbiz, they are a remarkable success story, and testament to the fact that there are new ways of earning a following these internet days. Great energy, great music built around three great singing voices, and plenty of laughs. It’s a winning combination. Michael Coghlan Axis Of Awesome performs Viva La Vida Loca Las Vegas at The Garden Of Unearthly Delights’ Aurora Spiegeltent until Sun Feb 22. Book at FringeTIX on 1300 621 255 or adelaidefringe.com.au/fringetix. Click HERE to purchase your tickets. Great energy, music, singing voices, and plenty of laughs!